Cute and simple 9ct yellow gold dolphin stud earrings. Animal lovers will enjoy these simple everyday studs. 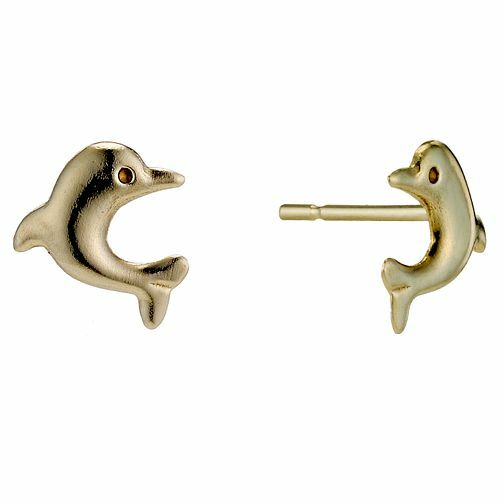 9ct Yellow Gold Dolphin Stud Earrings is rated 1.0 out of 5 by 4. Rated 1 out of 5 by Anonymous from Butterfly backs fell off on the second day My daughter was so disappointed when she lost one of the butterfly backs on the second day of wearing. We went into the shop on the high street to try and get a spare to be told, they don’t have any with small enough holes for these earrings. So we will have to buy another pair?!!!! We can’t afford that! We bought some plastic backs online, and their holes are too big! Unbelievable.